Ever since I was a young boy, as far back as I can remember, the Month of May was a special month. At first not for me, but it sure was for my dad. When I was a kid in Cub Scouts, he made me a car for the pinewood derby. It was fluorescent red. I didn’t like the color at all. “Dad, it’s pink,” I said. “I can’t race that.” Eventually, I did, and not until years later did I realize it was the STP #70 turbine car, exact same shape and all. If I’d only known then what I know now — it was a masterpiece. Years later, when I started watching, I was in awe of what I saw. Everything that goes into that race can make a man speechless. Back Home Again in Indiana, to this day, gives me a lump in my throat and a tear in my eye. The song is great, but the emotional feeling it can give someone is overwhelming. All the memories — for me, it was all the good times I had seeing my dad at his happiest and me years later. The roller coaster of emotions that a driver goes through during qualifying. The three wide start, the danger, the celebration — the Indy 500 has it all. We used to go to a lot of the IndyCar races in Phoenix, being closer to where we lived in New Mexico. I remember the first time I went, seeing all the drivers close up in the pits. It was like we were looking at movie stars. I had a little notebook and got it signed by all the drivers. I think my dad was more excited than I was on the inside, but he had to be cool on the outside. Great memories. I’ve been going to Phoenix for years, up until the IndyCars stopped racing there. My dad used to race at local dirt tracks in our area for years. He won a lot of trophies and a few championships, but he had one dream that he could never let go, and that dream was to race at the Indy 500. He worked hard all his life. He saved and saved. One day, he was looking through a motorsports classified section and saw an IndyCar for sale. He lit up and called the guys selling it right away. They said that if he bought it, they would deliver it to him. He spent his life’s savings and borrowed the rest from the bank to purchase this car. It had quite a few problems that he and his mechanics had to fix to get it running properly. He got permission from the city to test it out in an industrial complex that was a mile around. It ran a few good laps and then went off-track. One of the lower suspension pieces broke, causing the crash. He got all that fixed and waited to try and get permission to run it at Phoenix. The car was never right, and the IndyCar officials wouldn’t allow him to run due to his lack of experience. I have copies of the newspaper and magazine articles that were written about him. He even wrote a long letter to Roger Penske that I still have. 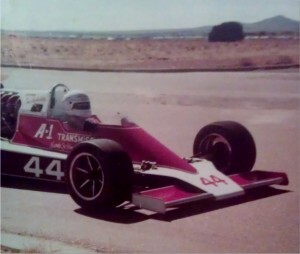 The car was sold soon after the attempt to race at Phoenix, and the dream was over. I’m sad to say that my mom and dad have passed away since then, but the memories will always be with me. I guess you could say that I’ll be carrying the IndyCar torch for years to come. It’s in my blood. I’m blessed with being able to go to races, write about them, and take pictures of the sport I love. I’m far from being a journalist, but what I say comes from the heart and always will. The Indianapolis 500 will always be a part of me for as long as I live. I even got married on Memorial Day weekend. When I went to Indy for the first time, the feeling that I got when I entered those hallowed grounds was breathtaking. I was in heaven looking at the pagoda, staring at every inch of the track. That will always be a very special place. I can’t turn back time, but I can enjoy all of the good memories that went along with the Indy 500 for me and my family. There are a lot of people who have passed who watch the Indy 500 from the front row now, and I’m sure they’re enjoying it. This is what the Indy 500 means to me.